What is happening with the 1995 Limited Edition Swarovski Eagle? In 1995, Swarovski produced one of its first numbered limited edition figurines, the Swarovski Limited Edition Eagle. My parents were charter SCS members and I remember them being notified of the exclusive offer available to USA collectors….the opportunity to purchase this figurine at a retail price of $1750. Within hours of the notification, they rushed to the local FedEx facility and overnighted the required paperwork and payment…after all, there were only 2900 of 10,000 allocated to the USA SCS members….who wouldn’t be in a rush? Meanwhile, it seems that all other areas of the crystal-collecting world had little to no restrictions for consumers. While it is unclear how many were reserved for the various markets, in Canada and in Europe, there was no prerequisite for the paying customer to be an SCS member, nor any rule indicating that there was only one Swarovski Eagle per customer. So, in 1995, in other regions, “anyone” could walk into a store that had the Numbered Limited Edition Eagle and purchase 2 or 3 if the store had them available. While the purchase process was quite select in the USA, leading collectors to think this was perhaps a premium offering, that was not quite the case. And in 1995, with the internet still in infancy, no one knew any different. The Swarovski Limited Edition Eagle sold out in the USA very quickly. USA Swarovski collectors who pondered the opportunity to purchase most likely missed out. Secondary market prices began to rise quickly. By 1998 / 1999, the Swarovski Eagle was selling in the $6500 – $7500 price range. Prices settled down, and remained steady at $4900 – $5500 2003 through 2005. Around 2002, we began hearing stories, and experiencing first hand, feathers detaching from the wings, wings detaching from bodies, and bodies detaching from bases. For the most part, this was an issue of the glue letting loose and mostly occurring during shipping. 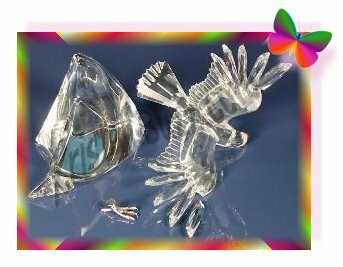 The damage to the Swarovski Eagle became a bigger problem when shipping carriers (US Mail, UPS, FedEx, etc) would deny claims since this was likely a manufacturer issue, not a rough handling issue. But when little feathers detached and would rattle around inside the box, many feathers and other crystal components became nicked and chipped, ultimately leaving very little worth or salvage to the remainder of the Limited Edition Eagle. So about this time, Crystal Exchange America changed their policies on selling Eagles. The Swarovski Numberd Limited Edition Eagle would have to be personally delivered or personally picked up to avoid the Eagle from becoming damaged. If delivered, the company would basically buy a contractor a seat on a plane, arrange a meeting place and time for the contractor and buyer to meet for the exchange, and fly the contractor home. Crystal Exchange America continued selling the Swarovski Eagle in this fashion until 2008. 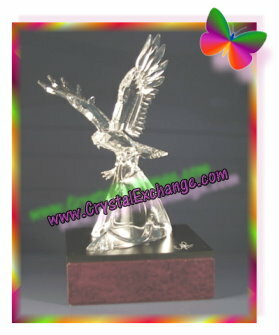 In 2008, Crystal Exchange America ceased selling the Swarovski Eagle. More and more eagles were coming unglued in display cases, as well as inside the manufacturer packaging. The risk was simply far too great that something would go awry on such a high dollar figurine. Also, in 2007 and 2008 Swarovski Eagle prices dropped dramatically, with an average selling price of just under $4000. Why does the ‘unglue’ issue occur on the Swarovski 1995 Eagle? I believe there are two main reasons. Less was known about the adhesive and its long-term bonding on very large figurines. Remember…this was the biggest figurine ever produced. There was such little surface area to glue, that makes it more difficult to maintain a strong bond. So, now, in 2012, what is happening with the 1995 Limited Edition Swarovski Eagle? I checked ebay, and there are only a few completed sales on them, with prices ranging $2400 – $2900. Prices seem quite low these days. If you are a Swarovski crystal collector, I’d suggest purchasing the Swarovski Limited Edition 2011 Bald Eagle instead…..I would not recommend buying the 1995 Eagle since the ‘detaching’ is quite wide-spread at this point. It does not matter if the Eagle is on display or safely stored in its shipping suitcase, detachment is a serious problem and concern for such an expensive figurine. If you have the 1995 Limited Edition Eagle, and it is no longer intact, you can contact www.TCWizard.com for a reglue quote. The Crystal Wizard can re-assemble the 1995 Limited Edition Eagle with proper factory adhesive so that it does look brand new again. We frequently hear stories of collectors pulling them out of storage thinking they’ve got to be worth $10,000 or more by now. Sadly, when they phone us about selling, they get the unexpected news that the value is far, far less. And the news gets worse, when they physically remove it from the case, and the Swarovski 1995 Eagle is broken or comes apart. At that point, we can only suggest they sell it damaged / as is, or pay for a professional to reglue the entire figurine. While this article is not one of a positive nature, I hope that it does provide some insight if you are considering to purchase the 1995 Swarovski NLE Eagle or that it offers an alternative if yours is not ‘whole’ that you may have options so that it could be beautifully displayed in your case.